AudioFire8 offers the same high quality hardware and software found in our popular Layla3G product, but with the addition of a FireWire interface. 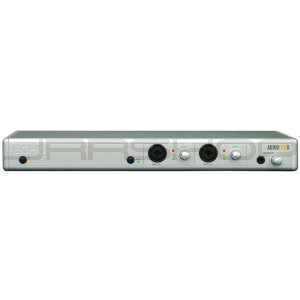 With the AudioFire8 you can record 24 bit 96kHz audio with low latency monitoring on any Windows XP or Mac OS X computer (desktop or notebook) with a FireWire port. AudioFire8 is the perfect center for any professional studio, whether at home or on the road. It has 2 universal inputs with mic preamps, phantom power, channel inserts, and trim knobs so you can just plug in your microphone or instrument and record whenever or wherever you want. AudioFire8 also comes with 6 balanced analog inputs (TRS), 8 balanced analog outputs (TRS), a stereo headphone output, 2 FireWire ports, S/PDIF I/O, MIDI I/O, word clock synchronization, and 10 channels of full duplex 24 bit 96kHz recording and playback. Tracktion is a radical new type of music production software - giving you a clean, intuitive, and clutter-free interface without losing professional features like drag-and-drop editing, a built-in sampler, VST plug-in support, track freezing and more... all right at your fingertips. AudioFire12 comes bundled with Tracktion version 1.